Why is homosexuality socially marginal yet symbolically central? Why is it so strangely integral to the very societies which obsessively denounce it, and why is it history--rather than human nature--that has produced this paradoxical position? These are just some of the questions explored in Sexual Dissidence. 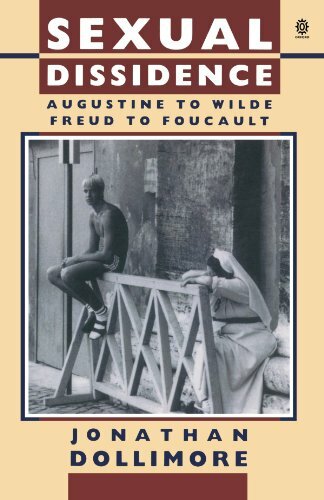 Written by a leading critic in gender studies, this wide-ranging study returns to the early modern period in order to focus, question, and develop issues of postmodernity, and in the process brilliantly link writers as diverse as Shakespeare, André Gide, Oscar Wilde, and Jean Genet, and cultural critics as different as St. Augustine, Frantz Fanon, and Michel Foucault. In so doing, Dollimore discovers that Freud's theory of perversion is more challenging than either his critics or his advocates usually allow, especially when approached via the earlier period's archetypal perverts, the religious heretic and the wayward woman, Satan and Eve. A path-breaking book in a rapidly expanding field of literary and cultural study, Sexual Dissidence shows how the literature, histories, and subcultures of sexual and gender dissidence prove remarkably illuminating for current debates in literary theory, psychoanalysis, and cultural materialism. It includes chapters on transgression and its containment, contemporary theories of sexual difference, homophobia, the gay sensibility, transvestite literature in the culture and theatre of Renaissance England, homosexuality, and race.